Lookmark is a bookmarking and monitoring service for iTunes content. It’s an excellent way to save apps, movies, books, and other media for later. Users who purchase a subscription can also use Lookmark to track price changes for apps, which is useful for bargain hunters. Today, Lookmark released an update that pushes the app further into the realm of app monitoring that started with price tracking. 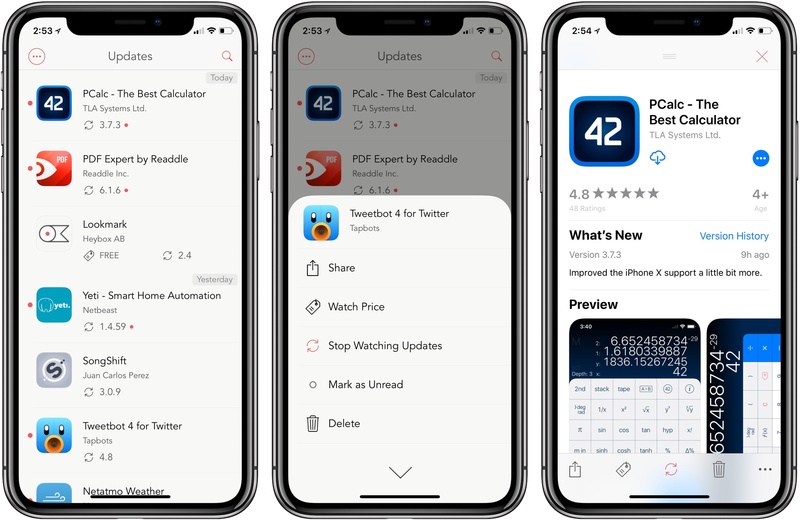 Now, users can also track when iOS and macOS apps are updated on the App Store and Mac App Store. There are two ways to bookmark iTunes content in Lookmark. The first is the app’s extension. 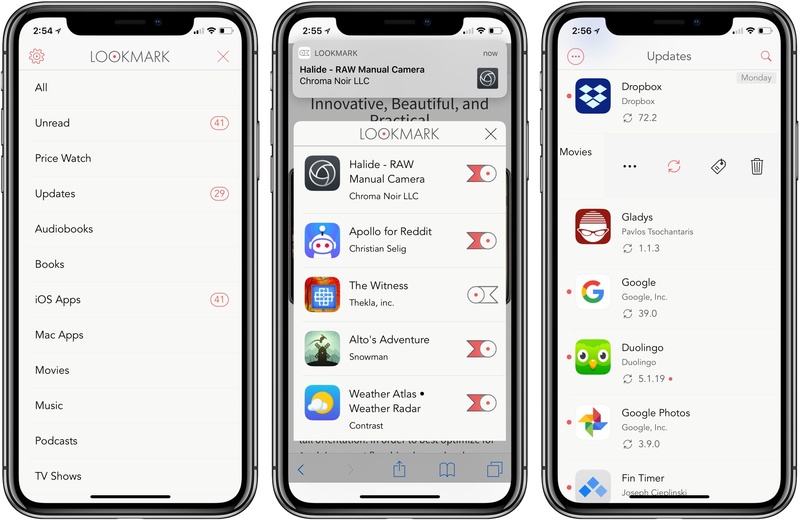 Whether you’re in the App Store, Mac App Store, iTunes Store, or iBooks Store, you can pull up the share sheet, pick the Lookmark share extension, and send an item to Lookmark, which slides a sheet up from the bottom of your screen acknowledging that an item has been sent. On my iPhone X, the sheet didn’t always come completely into view before disappearing again, though it’s been enough to see that the item was added to Lookmark. The extension works in browsers too. For example, if you find an article with links to several items, the extension will detect them all and let you choose which to send to Lookmark. The second way to add media to Lookmark is from a Mac using the app’s Safari or Chrome extensions. Filtering saved media, saving multiple apps with Lookmark's share extension, and swiping to set up tracking. From inside the Lookmark app, you can access Apple’s store pages for your saved media, which can be filtered by type and other criteria like whether there has been a price update. Saved media can be shared or deleted, and if you are a subscriber, you can turn on price and update monitoring for apps. This last feature is new. By turning on update watching, subscribers will be alerted to new updates to apps with rich notifications that include the release notes. In Lookmark, there is also a new dedicated Updates section where you can view all the updates you track chronologically. Update tracking is a great feature for anyone who likes to nerd out on release notes and understand what’s going on with their favorite apps. It’s also an excellent tool for developers who want to keep an eye on the competition and writers who cover apps. For a long time, some of the apps I keep on my iPhone have been there solely so I could easily track updates using Apple’s App Store app. In fact, it was Federico needling me on an episode of AppStories about the number of apps on my iPhone and my explanation of why I have so many that was part of the inspiration for Lookmark’s update tracking feature. I’m excited about the prospect of simplifying my app tracking workflow with Lookmark, but I do have a few things I hope are implemented in the future. Lookmark has become as much a reference tool as it is a bookmarking service. Consequently, I’d like to see a Universal version in the future so I can have it open on an iPad in Split View next to my text editor. App updates are reported within about five hours of appearing in the App Store. As someone who covers apps, I’d like an option to increase that frequency as part of a higher tier subscription. I recognize that there are limits on how often an app can query the iTunes Search API, but perhaps there’s a reasonable price point at which that wouldn’t be an issue. I’d also like to be able to set a schedule to check for updates. For example, I’d set Lookmark check for updates just before I get up in the morning so I could look over any overnight updates. It would be handy to be able to set up a template for the way apps are imported into Lookmark too, so I wouldn’t have to enable update checking for every app I add. Folders for organizing apps into groups and the ability to copy release notes would also be a big help given the number of apps I follow. Lookmark has always been an excellent option for saving content for later whether you’re waiting for a deal or simply want to think some more before buying. However, price and update monitoring for apps have evolved Lookmark into something more. The app has become a powerful tracking tool that fills the needs of a variety of people interested in apps. I’ve already imported dozens of apps into Lookmark to track updates and price changes and look forward to what it has in store for users next. Lookmark is available on the App Store.